The Rangers lineup will be changed even further as Rick Nash leads the Blueshirts into Columbus to face his former team. Last year, when Nash returned to Columbus for the first time since coming to New York, Rangers’ fans were treated with one of his best, and most emotional, games of the season. 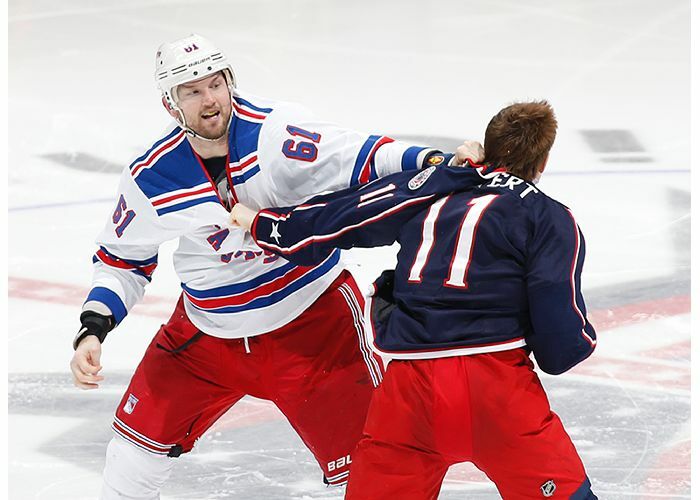 Rick Nash had a very eventful return to Columbus last year, which included a goal that was called back, a fight with Matt Calvert (pictured), and excellent play from the big man. Nash did not score in the game, but was all over the ice, and registered 7 shots on goal. Nash did get the puck past Blue Jackets’ goaltender Sergei Bobrovsky, but it was called back on a controversial incidental contact ruling. Afterwards, Bobrovsky slashed Nash on the back of the legs twice, and flung Nash’s stick away from him, to which Nash responded with a shove. An all-out brawl began after that. Nash also dropped the gloves with Matt Calvert early in the third period. The Rangers went on to win that game by a score of 3-1. So if last year’s matchup is indicative of what we will see tomorrow, it will be another fantastic and heated contest. Expect Nash to be as fired up as he was last year, especially after coming off of a huge first game of the season. The first change in the lineup for tomorrow comes in the goaltender’s crease. After making 23 saves in a solid effort against the Blues, Henrik Lundqvist gets the night off. Cam Talbot will make his first start and appearance of the season. Last year during the regular season, Talbot had a record of 12-6-1 along with a 1.64 GAA and was a very effective backup to Lundqvist. 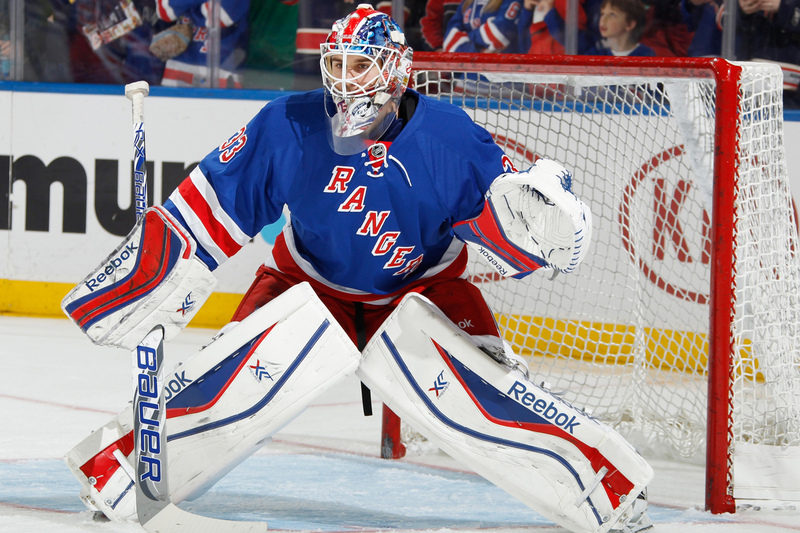 Cam Talbot will make his first start this season tonight against the Blue Jackets. This change allows Lundqvist to be rested and ready for New York’s home opener on Sunday against the Toronto Maple Leafs. Matt Hunwick will make his Rangers debut tomorrow, and will be replacing Dan Boyle, who will miss the next 4-6 weeks with a broken hand. However, Hunwick will most likely not take Boyle’s defensive slot. During Friday’s practice in Columbus, Hunwick skated alongside John Moore, and Kevin Klein was paired with Marc Staal. Kevin Klein will have an increased role for the next 4-6 weeks, as he assumes the second line defensive pairing alongside Marc Staal. Staal and Klein are both excellent defensively, and this has potential to be another shutdown defensive line for the Rangers. What is left to be seen is how effectively Moore and Hunwick will communicate on the ice, as well as how well they can handle defensive duties. The two have not skated together all that much, both in practice and the preseason. 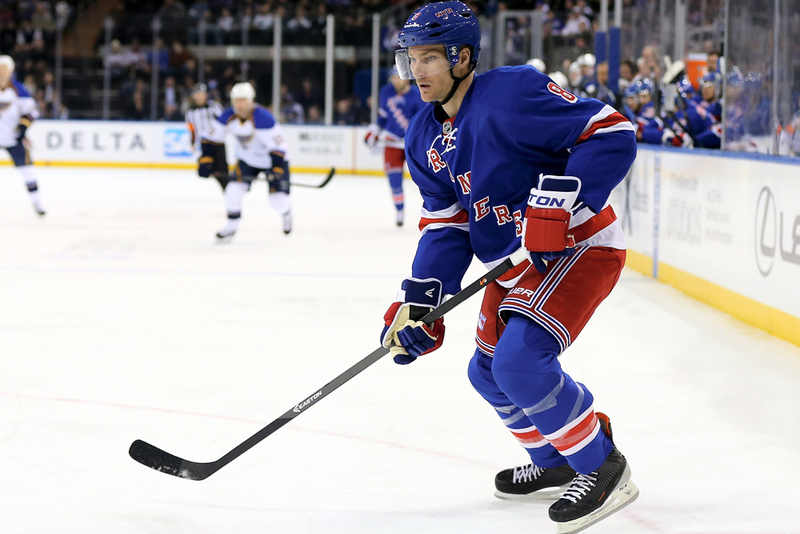 Michael Kostka was recalled from the Hartford Wolf Pack and will serve as the seventh defenseman for New York. Vigneault likes to always keep 7 healthy defensemen, and likely wants to keep as many options around incase Kostka or Hunwick are not the right answer to the Rangers’ problems. 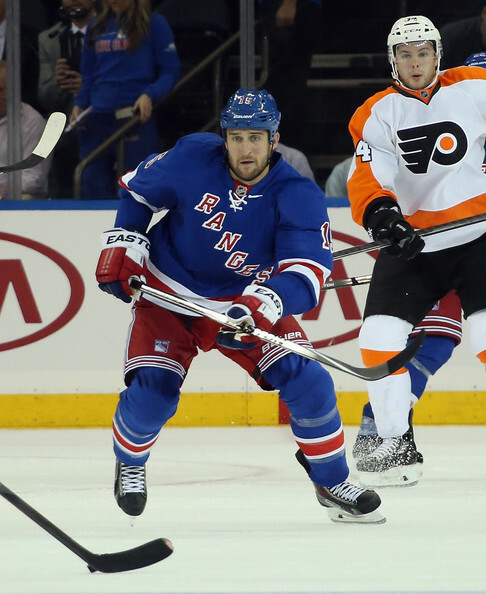 Tanner Glass is now listed as a game time decision, and was given Friday off for a “maintenance day.” Glass’ back was “a little tight” according to Rangers’ head coach Alain Vigneault. During the practice that Glass missed, newcomer Kevin Hayes, the 24th overall pick in 2010 by the Chicago Blackhawks, was inserted into the lineup. Hayes wound up centering the third line in between Anthony Duclair and Lee Stempniak. JT Miller was shifted to the left-wing position on the fourth line alongside Dominic Moore and Jesper Fast. Tanner Glass will be a game time decision tonight as he deals with a tight back according to Vigneault. Glass had a solid debut for New York. He was effective on the penalty kill, which was a perfect 5-for-5 in St. Louis, and played a very physical game, something that was missing from the Rangers team last year. Jesper Fast also practiced today after taking a slapshot off of his forearm against the Blues. While watching the broadcast on MSG Network, it appeared that his arm was swollen and bruised, but he did finish the game. He will likely play tonight. One thing to take note of is that Ryan Malone was not in the practice lineups. Malone had a solid preseason, but Alain Vigneault has constantly said they he does not know where he fits into the lineup. Malone scored two goals in the preseason, but struggled last year, scoring 5 goals and 10 assists in 57 games for the Lightning before they bought out the final year of his contract in June. Vigneault also changed up the power play lines for practice. With Dan Boyle out, someone else will need to step up and quarterback the power play. Lee Stempniak, who played the point against St. Louis on the power play, is a likely candidate. Mats Zuccarello was playing alongside Ryan McDonagh on the first power play unit. While this may seem odd at first, playing the point requires certain skills that Zuccarello does possess. Zuccarello is an excellent passer, and can thread the puck through defenders to an open Ranger with ease. He has good vision, and a decent shot. His passing abilities are reason alone to give him a shot at the point. Vigneault also mentioned that Martin St. Louis or Derick Brassard may also spend some time playing higher up on the power play. 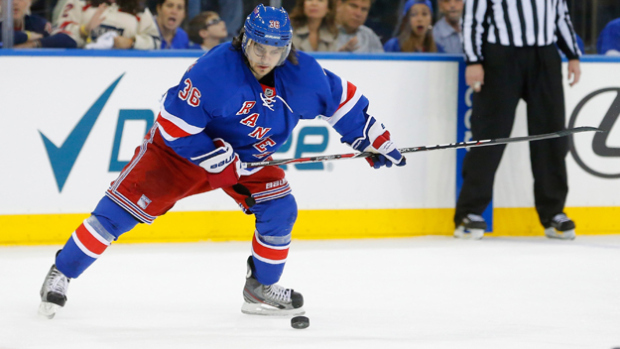 Zuccarello may see an increased role in the power play following the injury to Dan Boyle. His excellent vision and passing skills may prove to be a valuable asset for the Rangers on special teams. Anthony Duclair also saw some power play time during practice, alongside Stempniak and Kreider. The last bit of Ranger news from a busy Friday was the fact that veteran center Matthew Lombardi did not report for his assignment in Hartford, and was placed on unconditional waivers by the Rangers. This means that after he clears waivers, he will be released. Lombardi will most likely return to a European league to try and obtain more valuable minutes there. This frees up a roster spot for the Rangers. With Boyle out for an extended period of time, and inexperienced replacements in Kostka and Hunwick, maybe New York will go after a veteran defenseman to solidify the third line. Any breaking news and lineup announcements for tonight’s game against the Blue Jackets will be posted right here on The Ranger Zone. Posted on October 11, 2014, in Game Previews and tagged Anthony Duclair, Carl Hagelin, Chris Kreider, Dan Girardi, Derick Brassard, Henrik Lundqvist, King Henrik, Madison Square Garden, Marc Staal, Martin St. Louis, Mats Zuccarello, MSG, New York Rangers, NHL, NHL 2014-2015 Season, NY Rangers, NYR, NYR Season Opener, Rangers Season Opener, Rangersnation, Rangerstown, Rick Nash, Ryan McDonagh, St. Louis Blues, The Duke, The Ranger Zone. Bookmark the permalink. Leave a comment.